Our development project will enable the use of up-to-date floor plan graphics in the applications of enterprises whose core business does not involve floor plan maintenance. This also means that the end customer does not have to pay for maintenance of one and the same floor plan in different systems. Our aim is to facilitate the use of graphic data and lower the threshold for creating an application that uses the floor plans offered by the Optimaze Floor Plan Platform. The Optimaze Floor Plan Platform is shown in the picture below. 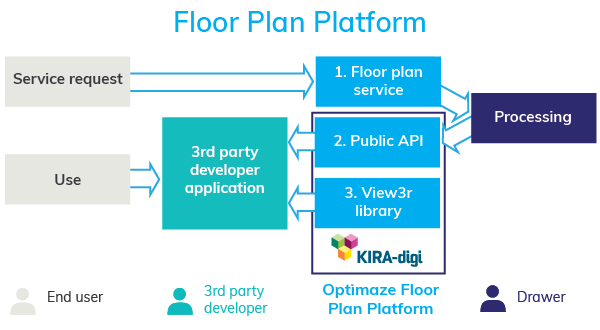 The sections to be developed in the KIRA-digi project are highlighted and cover parts 2 (Public interface) and 3 (View3r library) of the Platform. We receive support for development from the KIRA-digi project, which is the Government's key project for renewing the property and construction sector through digitalization.